There have been some huge leaps in lightbox technology in recent years. I’ve owned 3 lightboxes in my time, one being a repurposed dental x-ray box, the second being a traditional style box and the third being this which I bought as a possibly temporary replacement for my more traditional-style box. But I might not be swapping back so soon. The Light Pad itself is a rectangular prism that measures 17 7/8” diagonal and 14 1/8” x 10 5/8” x 3/16”, meaning it covers quite a large area, but is very slim. The workable white/translucent area has markings on the side indicated in centimeters 12 ¼” (31cm) x 8 ¼” (21cm) with a ½cm margin. The non-workable black margin is about ¾“ all the way around the pad and it’s only features are the power button and a logo. 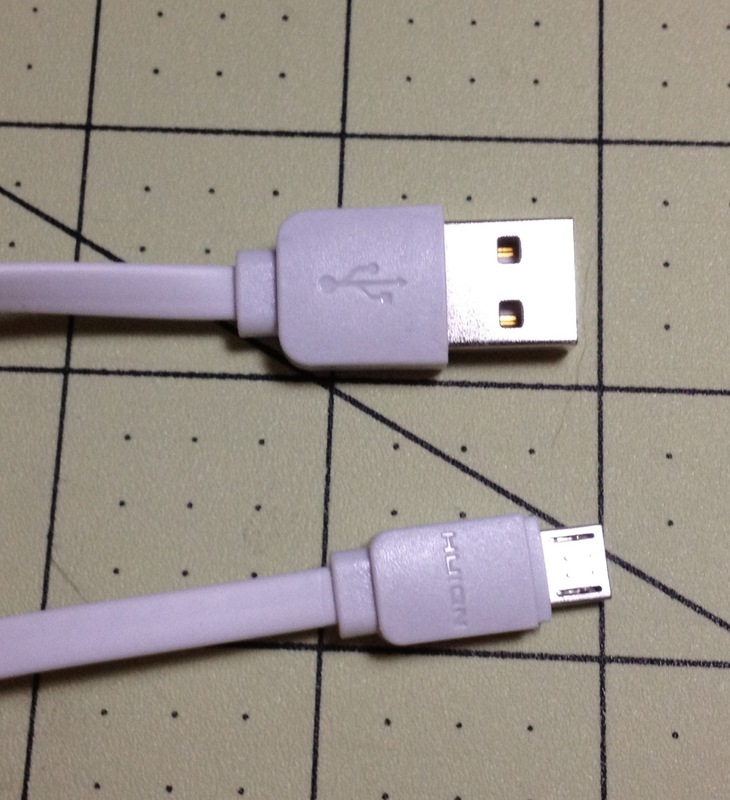 On the side of the device next to the power button is a micro USB port that is only used for power (this version has no internal batteries), and a red LED will come on when the device is correctly connected. On the back of the device there is some modest information and nicely padded feet that prevent the pad from sliding around when being used. Using the Light Pad is a breeze. Simply touching the power “button” lights up the entire workable area to the highest brightness setting (which isn’t very bright, and being shone through a white plastic makes it much less glaring on the eyes). Touching and holding the button will start the pad lighting up, and releasing the button during this will keep the pad at the current brightness setting. This setting is remembered and the next time one starts the device it will light up at the chosen setting unless you hold the button down again. The working area accommodates A4 and Letter sizes well, and the light on the brightest setting easily works with 2 sheets of 110lb cardstock. The plastic the surface is made from is very smooth, but resists sliding and scratches. The feet are also very nice and the device is stiff enough that it doesn’t bend around them under normal use (I still wouldn’t go stacking things on it). I don’t think I’m going to be going back to the more traditional lightboxes anytime soon. In my opinion the only advantage they offer is an angled working surface, which is a feature I never really used. 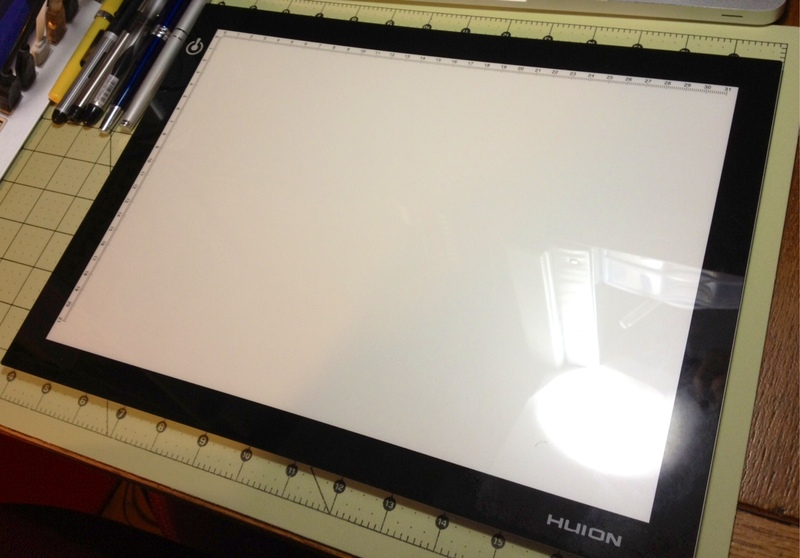 The Huion Light Pad is a great lightbox; it’s sufficiently lighted and durable enough to be easy to work with, thin enough that is stores easily, and draws very little power. Its overall workspace footprint is very small, and its job is done almost flawlessly. I do find the red LED indicator light to be annoying but I can’t think of a better way to do things and it is much less troublesome than other indicator lights I’ve had to deal with. I also have no use for the multiple brightness settings but I suppose it’s better to have it than not. Still, the device has become a permanent feature of my workplace and I would recommend anyone looking for a lightbox to look at these cheaper and thinner LED alternatives to the traditional boxes. 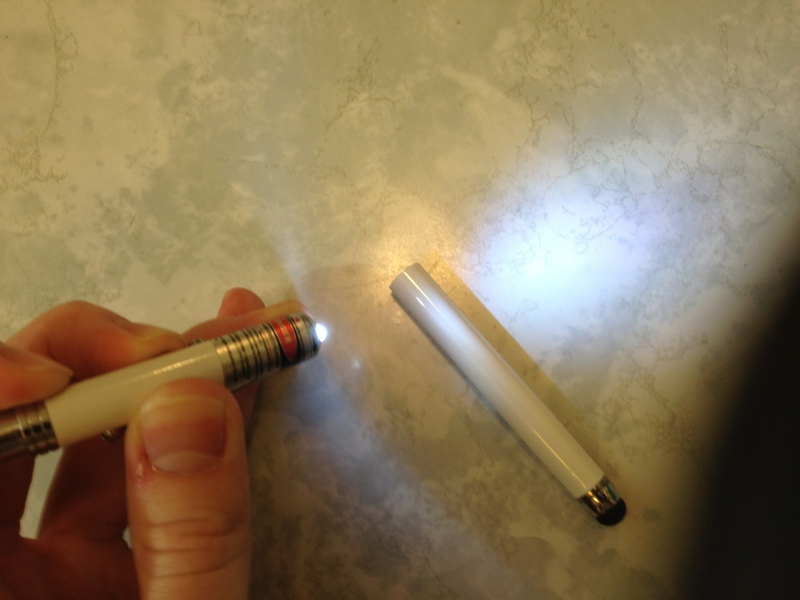 The light is really just a white LED that’s stuck in the end of the pen. There’s no focus, so it dissipates rather quickly. You could get an idea about the shape of a small room, find a key, or perhaps locate something stuck behind some furniture, but that’s about it. Nothing far away can be seen, and nothing in great detail. But it still works alright. Interestingly enough, both the light and laser can be turned on at the same time. The laser is dimmed significantly by this, but the light seems unaffected. The laser pointer works fine. It’s one of the standard cheap ones that can be found almost anywhere. It will hurt your eyes, but isn’t very bright on anything else. It isn’t very well focused and will spread out over long distances. But inside a regular sized room, it is very functional as both a people and cat toy. 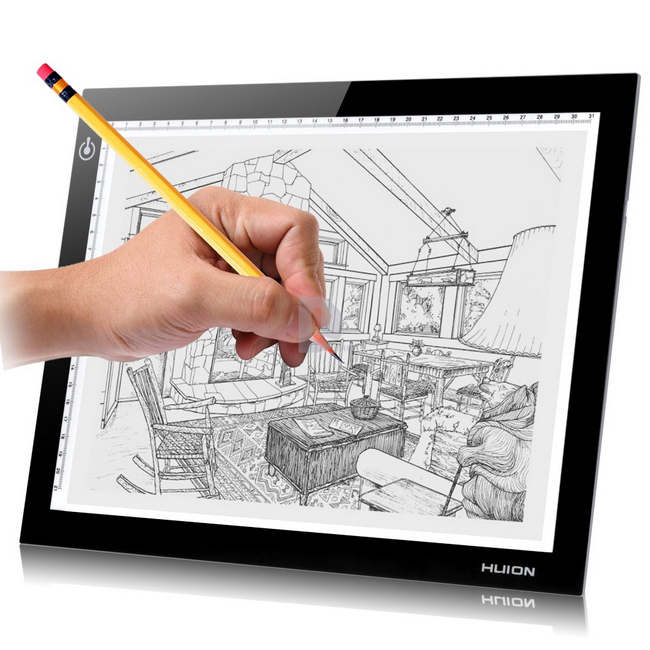 The stylus works with modern touch screens, and it’s fine. It’s so easy to make a stylus that works with these screens now it’s unremarkable. It’s a bit cheaper than the norm and seems like it might wear out, but I’d say the worst thing about it is that you have to watch out and not hit the buttons and blind yourself when using it. Finally, the pen part. It works, actually quite well. 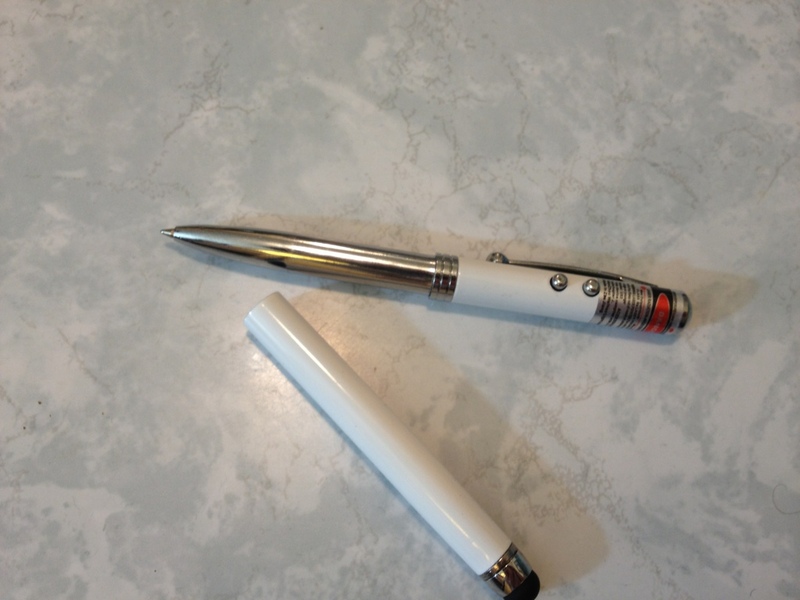 The tip is very fine, but despite that, it writes quite smoothly with little pressure. The inks a standard, almost-black ballpoint ink that’s water-resistant. The cartridge can’t be replaced as far as I can tell, though the batteries can be. So when you run out of ink you’re out and just left with the other features. That would seem to indicate the pen is not a primary function. The sleeve with the stylus has to be removed to access the pen, and this is not held on very well. It slips and can come off with a bit of a shake. There’s also nowhere to put the sleeve when using the pen, meaning it’s a two-handed operation. 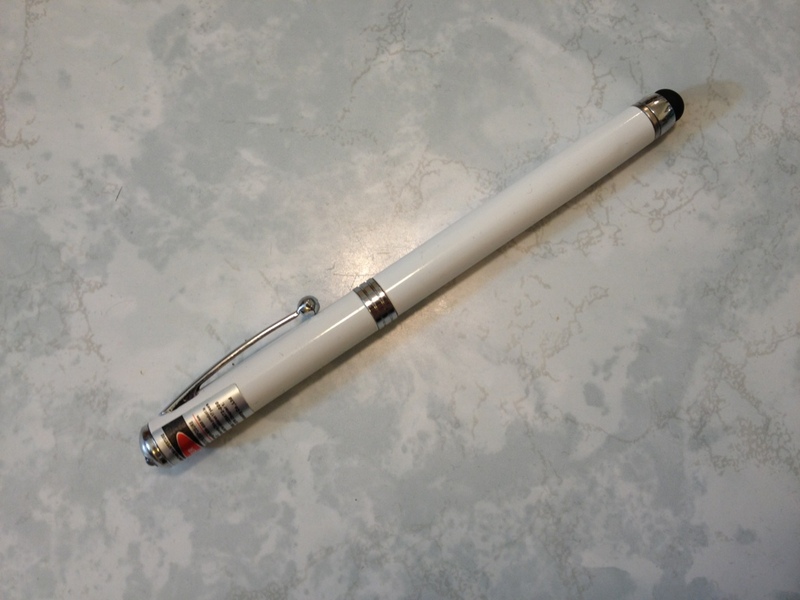 A couple of other things: the clip works well, there’s a warning under the laser but otherwise no information printed on the pen, and the white smooth color with “chrome” trim looks nice, but not very professional, and it’s quite slippery. Overall, every action it performs is done passably, but not well. It’s a fun device to mess around with or have if you want any or all of the 4 uses, but won’t use any of them that much. The batteries don’t last that long, the ink cartridge is small and not replaceable, and the overall tolerances aren’t very tight. The metal construction is nice, but the product seems to be made with disposability in mind. It’s fun, and good for the money. Just don’t expect much out of it.